Thirteen years after the first 3rd generation (high tech) university bike-sharing program, Bikeabout, was launched at Portsmouth University in Portsmouth, UK, North America will see its very own automated system with the launch of St. Xavier University’s program within the next few days. The Green Bike Program will allow students, faculty, and staff at the Chicago university to use their ID cards or obtain an access code to the lock via text message. The cost of the Green Bike program is not cheap, however, compared to alternatives, it is a great deal for the university. The Examiner reports “the initial costs [total] $250,000 and $3,000 for monthly costs”, for a first year total approaching $290,000. Future year costs likely will include only the monthly costs unless the size of the bike-sharing fleet expands, requiring more bikes and stations. A report by George Mason University of Fairfax, Virginia, my alma mater, states the cost of constructing each parking space at the University is $7,000 with an annual maintenance cost of $1,000 (see the report in the Research section of the Blog). Therefore, university facility managers could exchange the construction of 41 new parking spaces for a bike-sharing program the size of St. Xavier’s. Universities are in many ways an ideal location for bike-sharing. With a young demographic and individuals who are generally more active, car-free, and willing to bike, bike-sharing will likely take-off. As the Bikeabout report (see Research section of The Bike-sharing Blog) states, a survey of Bikeabout users from Portsmouth University’s program “discovered that 33% of Bikeabout users were people who did not have a bicycle and most of them had not used a bicycle for several years. The scheme was thus re-introducing people back to bicycles.” A U.S. travel survey shows that the number one reason people don’t bike is not that they don’t feel safe cycling or the weather is poor, but rather they don’t have a bike. Bike-sharing fixes this as it makes bikes easily accessible, thus encouraging bike use. As a New York Times article this past week shows, bike-sharing is catching on at American universities. Whether universities are using 1st generation (no tech) systems, 2nd generation coin-deposit systems, or 3rd generation (high tech) systems like St. Xavier, bike-sharing’s time has come for campuses. One of the finer aspects of Bixi is how easily its stations can be assembled. There is no demolition of concrete or asphalt for the undergrounding of wires nor the need for an electrical hook-up as Bixi is solar-powered. Assembly, in fact, only takes a few seconds (give or take) in this time-elapsed video of one of Bixi's first modular stations. Thanks to Russell at Bike Share Philadelphia for sharing this video. 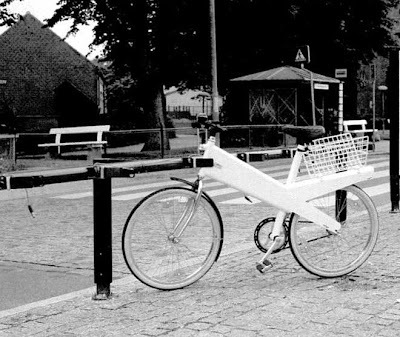 Even before Copenhagen launched its Bycyklen (i.e., "City Bikes") in 1995, Denmark had been experimenting with 2nd generation bike-sharing systems for a few years. The cities of Farso and Grena had 2nd generation programs as early as 1991 with Nakskov launching in August 1993 with a fleet of 26 bicycles and parking at four stations. The image above taken from "The Bicycle in Denmark" published by the Danish Ministry of Transport in 1993 shows what appears to have a coin-deposit lock which when a coin was inserted, would push out the key, thereby unlocking the bike from the station. This publication mentions the Eurobike company which worked with Nakskov on its bike-sharing program. My guess is Copenhagen's bikes were based on these bikes, but with improvements to make them more utilitarian. Copenhagen's bikes were developed by a different designer - Cycle Importers of Scandanavia (CIOS). In other Copenhagen news, as the 2nd generation coin-deposit lock is prone to theft, Copenhagen is considering 3rd generation models to implement in the future.